November 5, 2014 — It was the night before Halloween, and I walked into an opulent room of dark polished woods and marbles. Lining the walls just below the ceiling was the room’s signature feature, a series of fifteen 120-year-old paintings depicting the quest for the Holy Grail. But I was there to see what was looming in the center of the room against the backdrop of a massive marble fireplace. The form was thin, just shy of six feet tall and obscured by a black sheet. It was an ominous figure, dark and ghostly, but one that was very, very familiar to me. Over the past 15 months, I had stood in front of two other, similarly veiled figures. When those veils were lifted, I was treated to the debut of the H.P. 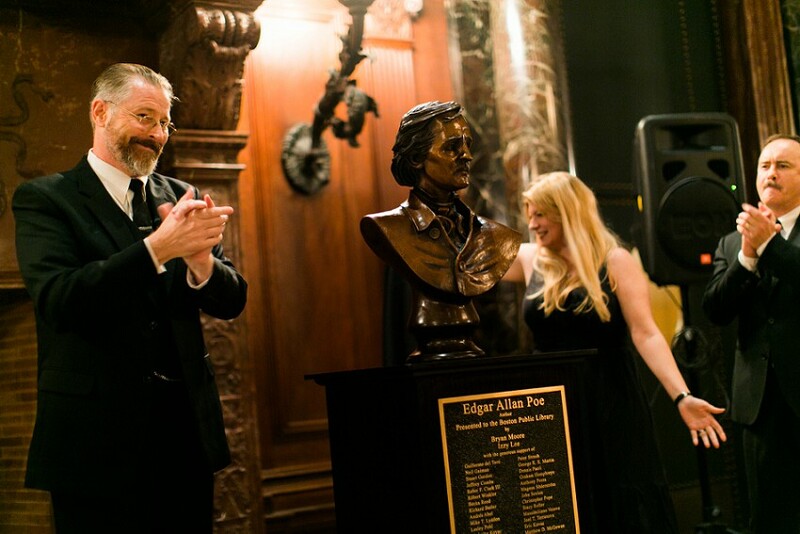 Lovecraft bust at the Providence Athenaeum in Rhode Island and then, just a month ago, the debut of the Edgar Allan Poe statue in Boston. 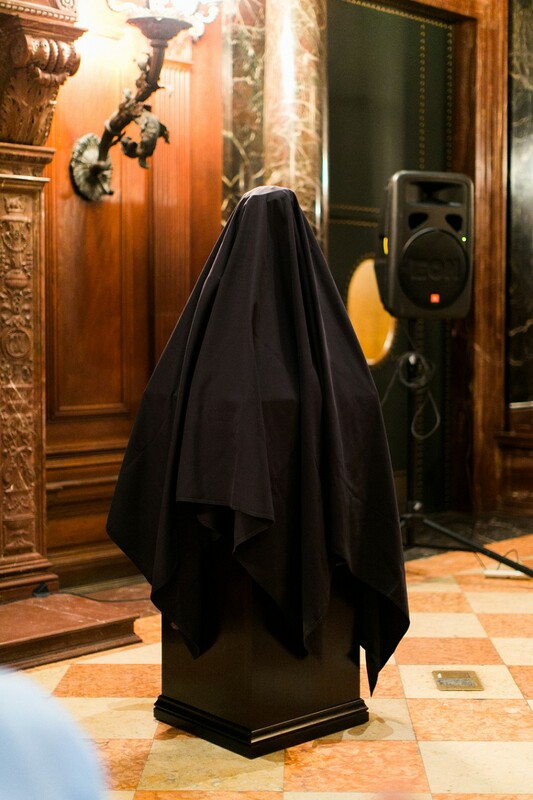 This time, it was a combination of the two, a bust of Edgar Allan Poe, awaiting its unveiling in the Abbey Room of the Boston Public Library, about half a mile from the generally acknowledged site of Poe’s birth. The last time I was at the BPL was a year before, to enter this very room and check out those Arthurian paintings by Edwin Abbey. I’d meant to do an OTIS post on them, but had yet to get around to it. And now this Poe bust is cutting in front of them in my queue. I was there early and the room was empty except for rows of unoccupied chairs and a small group of people including a man in a black suit and silver and black beard: Bryan Moore. He was the bust’s sculptor and another reason why the situation was familiar to me. He had sculpted the Lovecraft bust, after funding it with a Kickstarter campaign. 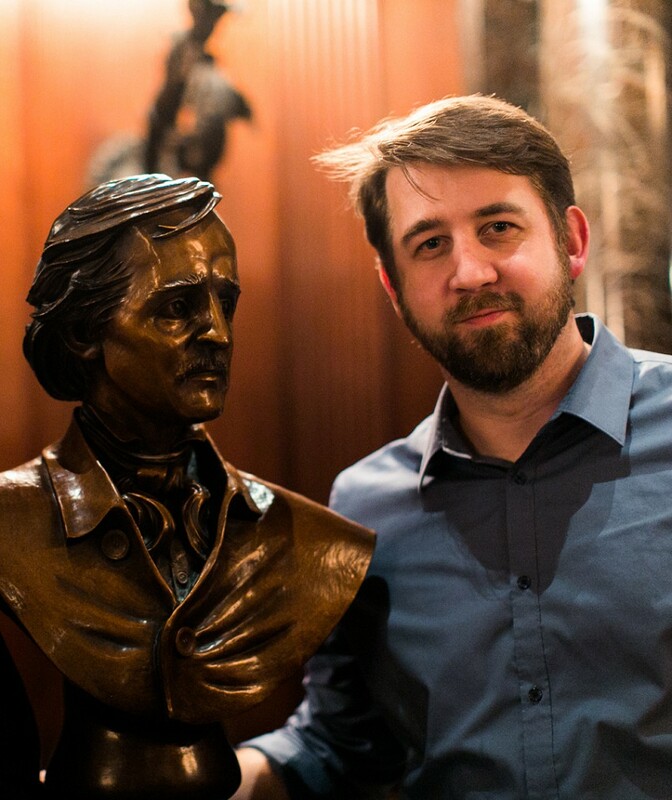 The Poe bust came to be along an identical trajectory, the product of crowdfunding and Moore’s own knives. 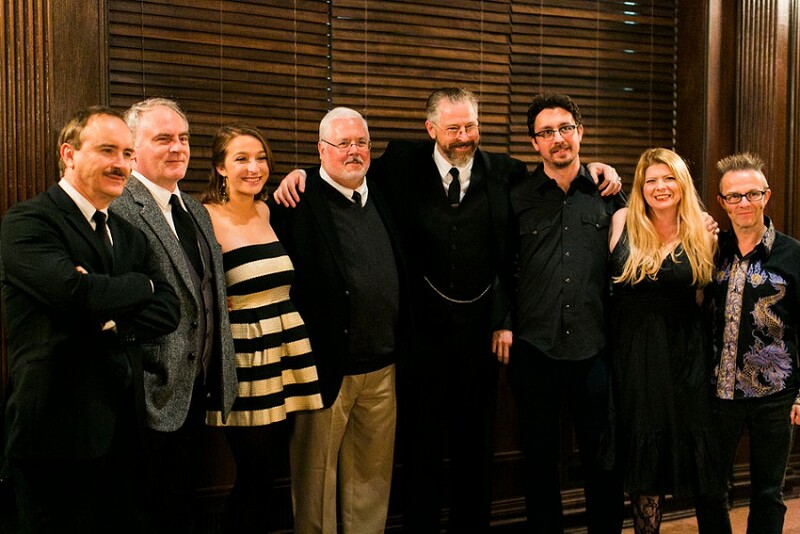 It was at the Lovecraft bust unveiling last year that I met Moore for the first time. 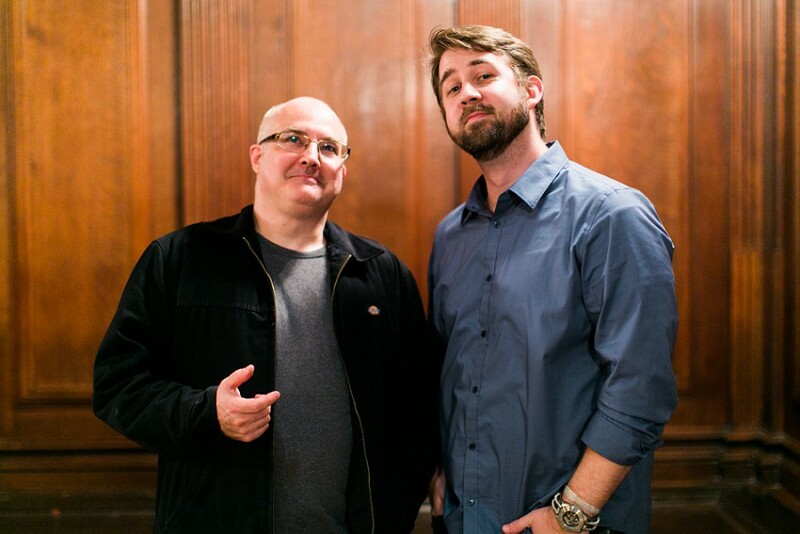 I interviewed him for my recent book Poe-Land: The Hallowed Haunts of Edgar Allan Poe, and we’d kept in touch since then. In the Abbey Room, he introduced me to a couple of his crew, including Graham Humphreys, a film poster artist from the UK who had designed the campaign poster for the Poe bust project. Moore gave me a sneak peek of the bust, lifting the black sheet—actually a tablecloth—from it. The surprise was less in the bust itself, as I had been following its creation on the socials since its inception, but more in the context. The rich bronze and that familiar mustachioed visage looked good in that extravagantly appointed room. As Moore returned to his event preparation, I wandered around the library waiting for my wife to arrive. Eventually, the room filled and a library representative walked up to the podium. She gave a few words before turning it over to Professor Paul Lewis, another Poe-Land alumnus. Lewis has kind of become Poe’s agent in Boston after, among other Poe-related activities, shepherding Stephanie Rocknak’s Poe statue into existence at the corner of Boylston and Charles Streets. He summarized the Boston-Poe story: The strange feud between Poe and the city, the pervasive apathy on the part of the city toward its native son in the century and half after his death, and the “public reconciliation” that began in October thanks to that bold, new Poe statue. He also noted how fitting it was to have Poe represented at the BPL, the city’s literary center. The BPL owns a nice collection of important Poe-related documents, including the letters of Rufus Griswold, who was Poe’s colleague, literary executor, and enemy. Poe’s name has always been etched into the side of the building along with other famous American authors, but it was far past time for him to be represented among the amazing works of art inside the BPL. 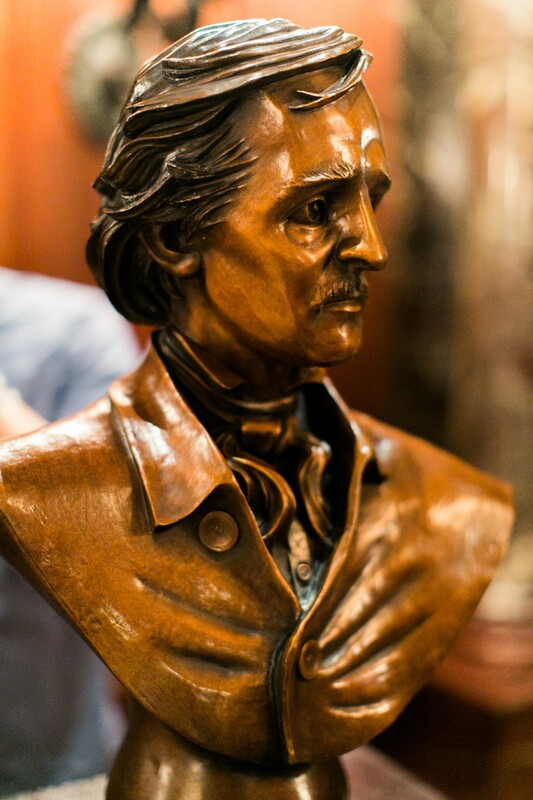 After Lewis came Moore, who introduced his team before he and Izzy Lee, a local filmmaker and his partner in the campaign, whipped off the black tablecloth to reveal the world’s latest bronze Poe. The moment of the unveiling. I’ve seen the major busts of Poe, George Zolnay’s at the University of Virginia in Charlottesville, Edmond Quinn’s at the Poe Cottage in the Bronx, and—my favorite—Daniel Chester French’s at Bronx Community College. Each one is unique in its take on Poe, and you can say the same of Moore’s. His is, naturally, a more modern depiction than those late 19th century/early 20th century busts. Moore’s Poe seems romantic somehow. Maybe it’s the generous sweep of his hair or the angle of his large eyes, but this seemed to be the bust of a romance poet—which Poe was (downright sappily sometimes)—as opposed to, say, a horror icon or an American figure. Poe is so many things. I should’ve prefaced this paragraph by stating I know nothing of sculpture. But as much of interest to me as the bust was the stand it torso’d on. Or rather, the plaque affixed to the stand. I have a weird compulsion toward plaques and will search them out wherever they’re affixed, but in this case it was for an even sillier reason. 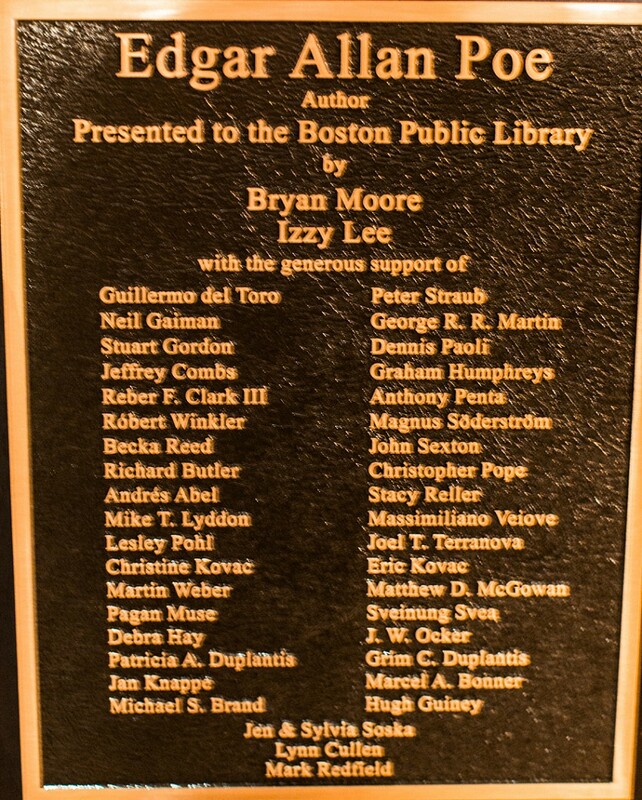 Because there, on that plaque listing the major contributors, a handful of names below Neil Gaiman and Peter Straub and Guillermo del Toro and George R. R. Martin, was my name. It seemed fitting for me to contribute to the project. Because of Poe-Land, I had spent so much time with Poe’s physical legacy and those who have dedicated some part of their life to it that finally contributing to it myself made sense. It was also a vanity thing, for sure, but all art is funded by somebody and vanity always plays a part. 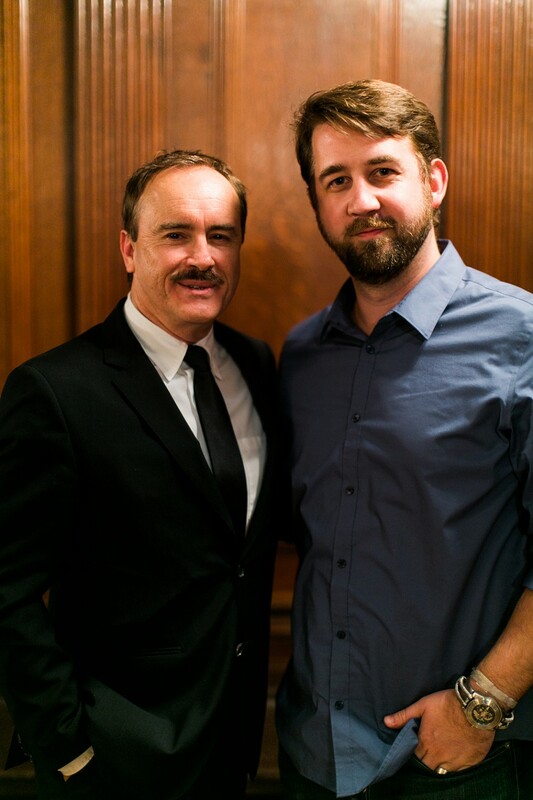 Afterwards, I got to meet up with some great people and fellow Poe aficionados like John Rozum, author of the comic books Xombi and Midnight, Mass; Rob Velella of The American Literary Blog; Mark Redfield of Poe Forevermore; even actor Jeffrey Combs, whom I interviewed last year over the phone. He was there to perform as Poe the next night at the Somerville Theatre (an event I had to miss as there was trick-or-treating to be done). Now, here’s the part where I would normally encourage you to go see the bust for yourself, but Poe has been prematurely buried. The BPL intends to place the bust in its Johnson Building…which is under refurbishment until like 2016. So Poe is currently crated somewhere. I mean, it’s their bust, so they can do what they want with it, and this kind of thing happens all the time with institutions entrusted with an embarrassing wealth of artwork. It’s just that in a city finally celebrating itself as the birthplace of Poe, it seems the better path is to find a public spot for him to hang out until his permanent niche is ready. But I'm biased. 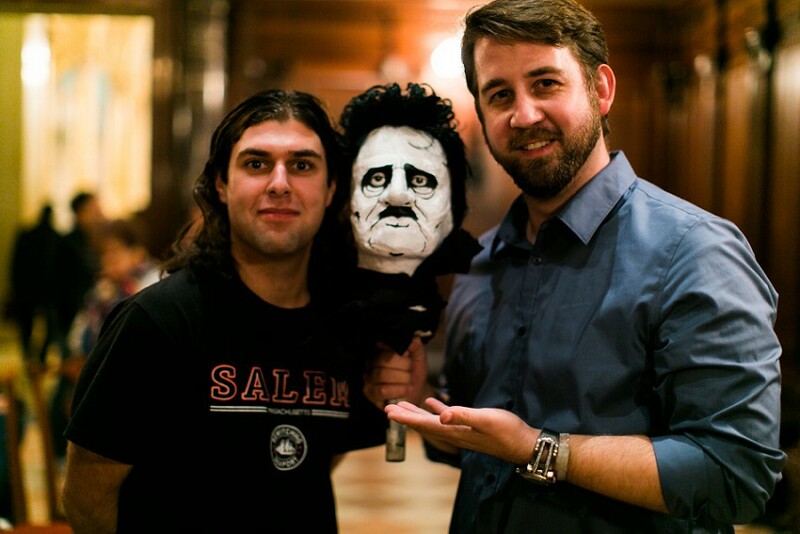 With artist Ted Dilucia and his Poe-head-on-a-stick. Bryan Moore, Anthony Penta, Izzy Lee, and Graham Humphreys. 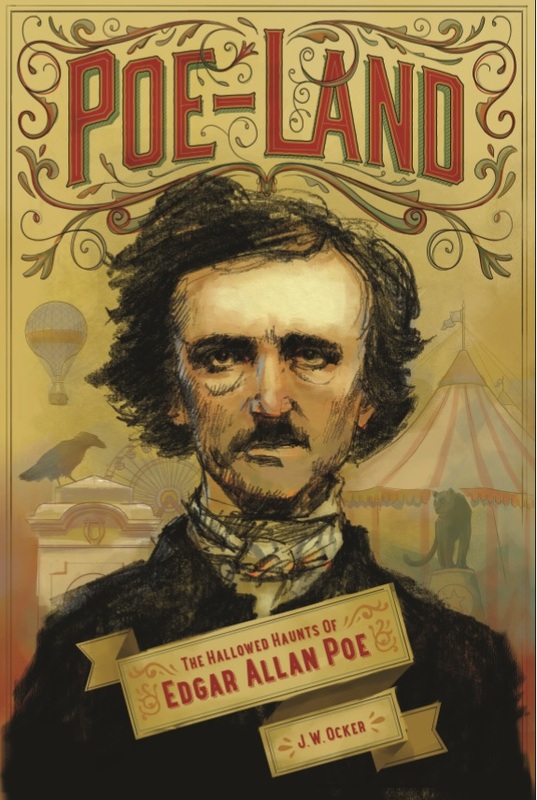 Check out my latest book Poe-Land: The Hallowed Haunts of Edgar Allan Poe to read about my quest to see how Poe is memorialized all over the country and beyond.